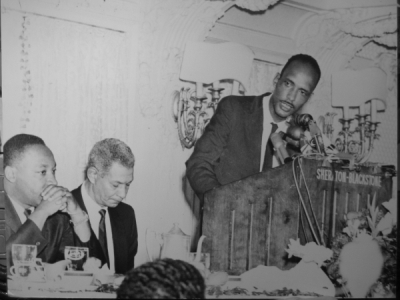 Civil rights activists, from left to right: Dr. King Bill Berry and Al Raby The Leadership Council for Metropolitan Open Communities was a nationally recognized fair housing organization founded at the end of Martin Luther King's Chicago Freedom Movement in 1966. For 40 years the Leadership Council fought against racial segregation in Chicago and around the country through litigation, direct housing assistance services and educational programs for real estate professionals. In 2006, the Council was disbanded for financial reasons. CURL has been working to collect an archive of information, interviews and documents about the history of the Council. CURL conducted approximately 30 interviews with individuals who were involved with the Leadership Council in a variety of ways, from former executive directors, former board members, legal counsel for the legal assistance program, leaders from other organizations that did work with the Leadership Council, and national academic figures in fair housing issues. The topics covered include the formation of the Leadership Council, their key accomplishments (such as the Gatreaux program, the development of testing practices and their work with individual families), and the events that led to the dissolution of the organization.